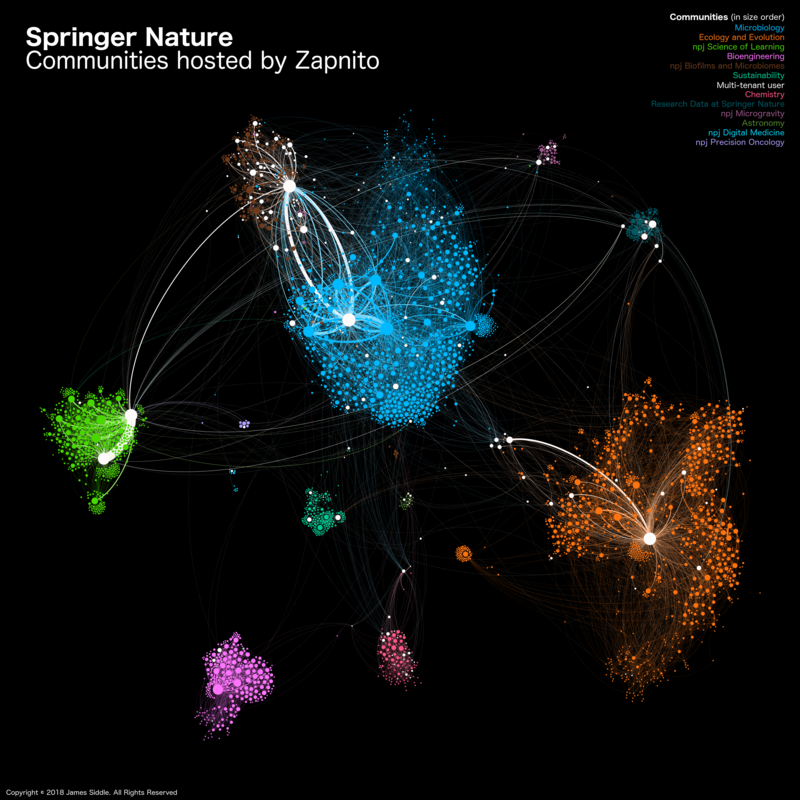 We visualised the Springer Nature communities hosted by Zapnito, and explored how knowledge spreads in the network. A couple of years ago, the publisher Springer Nature entered into a strategic relationship with Zapnito, an “Expert Network” platform. The goal was to facilitate knowledge sharing between employees, academic experts, and other interested parties, and there are now more than twenty different Springer Nature communities hosted on Zapnito, twelve of which are “Nature Research” communities and are the focus of this article. This network of communities represents an interesting opportunity to explore the relationships between expert communities, along with the way Zapnito is facilitating knowledge sharing. Click here for a high resolution version. This blog post introduces the Springer Nature communities, then provides a light-touch exploration of community structure and connectivity, and its relationship to knowledge sharing and dissemination. The post is a result of a collaboration between Zapnito, Springer Nature, and myself, and is cross-posted on my blog The Variable Tree. The data visualisation shown here represents the current state of the Springer Nature communities. It was created using the Social Network analysis tool Gephi, and each “node” (or dot) is one person - an author, a panel participant, a reader, etc. Nodes are connected by “edges” based on knowledge consumption or production, in the form of content views recorded in Zapnito analytics data. So individuals in the graph are connected when knowledge has flowed from one to the other, and higher quantities of knowledge flow are emphasised with thicker lines. The colours represent different expert communities, and a node will have a particular colour if the person is a member of the community. White dots represent people who belong to many communities, which Zapnito calls the “multi-network effect”. Node size is based on the total knowledge dissemination score of the person, specifically the “weighted in-degree” in graph terminology. This means that emphasis is given to individuals who have contributed the most in terms of knowledge across the network. There are a small number of prolific contributors, so we scaled node size to increase the visibility of more modest contributors. The layout of the graph was determined using Gephi’s Force Atlas 2 algorithm, which attempts to lay out the network in an aesthetically pleasing and understandable way using a physical simulation, a combination of spring-like and repulsive forces that makes the structure of the graph clearer. What can we learn about the knowledge sharing by looking at the structure of the Springer Nature network? Some structure is immediately obvious, notably the fact that there are clear, distinct modules for the different communities, and with strong links between some communities (which is discussed below). In terms of size, some communities are clearly bigger than others, which is likely due to a combination of maturity and topic popularity. Some communities are three years old, while others are only a couple of months old, and some research topics are especially popular, while others are relatively niche. Communities tend to be dominated by a small number of individuals, who are likely to be experts and prime contributors in terms of knowledge. The bigger communities also have many “second tier” contributors with strong connections to the prime contributor. This is particularly evident in the Microbiology and npj Science of Learning communities, and may be a result of “preferential attachment”, where newer community members prefer to connect with already well-connected individuals who are in a strong position to influence others. The network density (that is, the level of connectedness between people) within each community is characteristic of the Zapnito “expert network” use case, where there is a moderate degree of connectedness. This is in contrast to other use cases such as content hub or peer-to-peer learning, which tend to be sparsely connected as they are focused on more traditional publishing models. What about knowledge sharing between communities? If we look at the connections between the Springer Nature communities, we can see that Microbiology and npj Biofilms and Microbiomes are especially strongly linked, with high volume connections between the main contributors of the two communities, and many smaller connections between other contributors. This level of connectivity is understandable as the two communities are closely linked - in fact Springer Nature recently merged them as part of a move towards topic-centric communities involving a number of journals. There are also connections between other communities, but these are typically between just a handful of individuals (they are a little more obvious if you squint your eyes!). The links are likely to represent cross-disciplinary interest from community members, either because they are active members of different communities or have a passing interest in topics in other fields. The notable exception is the Bioengineering community, which appears to be more self contained than other communities. Interestingly, there is some indication of “bridging” between communities, where either individuals or small groups are drawn out of their main community, by virtue of the strong connections they have elsewhere. These bridges may act as important knowledge transmission conduits between disparate communities, and in the scientific research context may be indicators of cross-disciplinary research trends. Finally, there are a couple of small “breakaway” clusters, for example in the npj Science of Learning and Ecology and Evolution communities. These small clusters have been pushed out from the main community group by the graph layout algorithm because of their low level of connectivity to the rest of the group. The reason for the lack of cohesion is unclear, but could be caused by a new expert joining the community, publishing some content, and prompting followers (e.g. via Twitter) to participate. Similarly, the cluster could reflect a niche sub-domain within the main community, and potentially even the seed of a new community. This blog post is a fairly light-touch introductory analysis, so in part two of this series I’ll be taking a closer look at a specific Springer Nature community, with a view to understanding more about knowledge sharing within and beyond that community. I'm an independent IT Consultant, specialising in Technical Product Management. In my spare time, I blog about topics such as Data Vizualization, Natural Language Processing, and Open Data. Awesome post and analysis Jim. Niche networks are beautiful - especially when interconnected! Thanks for all your hard work on this. Looking forward to seeing Part II! Fascinating reading James. It's great to see the power of these interconnected networks so well illustrated. This has already helped identify the key influencers within this network of communities, which helps our customers understand what (i.e. who) community members most value and who to nurture to strengthen the communities further. I agree Jen. It's good to see this having value already.